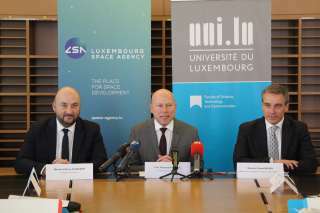 October 12, 2018 - The Grand Duchy of Luxembourg, represented by the Deputy Prime Minister, Minister of the Economy, Étienne Schneider, and the Republic of Poland, represented by the Minister of Entrepreneurship and Technology, Jadwiga Emilewicz, signed a memorandum of understanding (MoU) to start bilateral cooperation on space activities with particular focus on the exploration and utilization of space resources. The five-year MoU covers the exchange of information and expertise in the areas of space technologies, policy, law and regulation. Both countries agreed to regular exchange information on space resources and to promote a constructive dialogue with all United Nations member States, leading to the clarification and transparency of the current international legal and regulatory framework applicable to the exploration and utilization of space resources, thereby encouraging innovation and investment. To enhance international cooperation in these fields, the Grand Duchy has already signed similar agreements with Portugal, Japan, China, the Czech Republic and the United Arab Emirates.